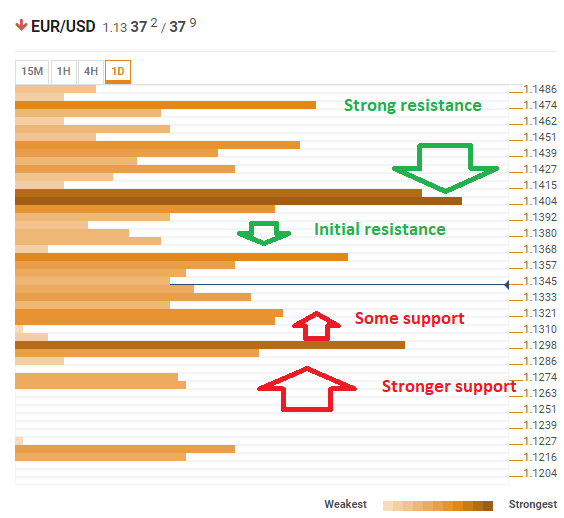 EUR/USD stabilized on lower ground as the market mood soured. Trump and Xi do not have a scheduled meeting. What’s next? The path to the downside is more appealing than the downside one. The Technical Confluences Indicator shows the pair has some support at around 1.1321 where we see the convergence of the Bollinger Band 4h-Lower, the Pivot Point one-day Support 1, the Fibonacci 161.8% one-week, and the BB one-day Lower. The next support line is more significant. At 1.1298 we note the confluence of the PP one-month Support 1, the PP one-day S2, and last month’s low. Looking up, the immediate resistance line at 1.1357 is already more substantial than the one at 1.1321. The cluster of resistance lines consists of the BB 1h-Upper, the Fibonacci 23.6% one-month, the Simple Moving Average 200-15m, and the SMA 50-1h. The toughest resistance line is at 1.1404 which is the juncture of the SMA 100-4h, the SMA 50-1d, the Fibonacci 38.2% one-month, the SMA 100-1h, the PP one-month S1, the SMA 5-1d, the BB 1d-Middle, and the Fibonacci 161.8% one-day.